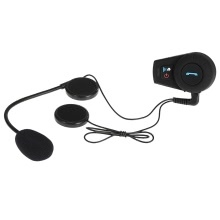 Motorcycle Helmet Wireless Bluetooth Intercom resolves your communication problem when riding a motorcycle. It&apos;s convenient for communication between the riders or between the rider and the pillion. With Dual Stereo Speakers, crystal clear voice quality gives you clear communication, HD music, clear GPS and FM radio. It&apos;s perfectly suitable for motorcycle, skiing, snowmobile, etc. Direct full-duplex intercom between rider & passenger or two riders up to 500 meters. It supports three riders connected, two people intercom. With Dual Stereo Speakers, crystal clear voice quality gives you clear communication, HD music, clear GPS and FM radio. Answering hands-free call by pressing the button when riding a motorcycle. It&apos;s compatible with almost all Bluetooth-enabled mobile devices such as, for iPhone7s 7Plus SE, for Samsung, for HTC, etc. Built-in 350mAh polymer Battery offers 5 hours of talking time for phone and 5 hours for intercom. Standby time is about 300 hours. Answer/ reject/ end call and redial the last number with multi-functional button. Easy to operate.